Got a problem with your 3DO? Ask! Well, some of you might remember that one of my first posts here was about my Fz-1 acting up when playing GEX. The music suffered from a terrible slowdown after some audio effects played, but only in GEX. I tried to burn many copies of different isos, and in different burners, with many different medias. I bought a brand NEW laser for it, and even bought a factory SEALED copy of Gex, but it would still have the exact same issues. I can only think something is ageing, that's the only explanation for what's happening. I tested the voltage regulators, fuse and power supply, they're all working fine. There's only one thing remaining to try: Replacing capacitors. Sure I could try and investigate cap by cap to find wich one is failing, but as a 20-22 years old console, even if I change one bad capacitor, I'm sure others will follow soon. So I decided to change every little f* single cap in the system. Even the capacitors in the CD-Rom drive! Not only that, but I've chosen to replace each capacitor for something much, much better than what it came factory with. For the power supply area, I'll be using long life, heavy duty capacitors and solid japanese capacitors when possible, low ESR. For the audio section of the board: audiophile Elna capacitors. For the Cd-Rom and rest of the motherboard: long life, high reliability capacitors, solid japanese when possible. Most of these capacitors are rated for 20.000 hours of life, much much better than what the 3DO came factory with. Postal service is laaaaame here in Brazil, it should take around 3 months for my capacitors to arrive. But I'll make sure to share my experiences here when this little adventure is complete. I'll be replacing the CR2354 ram battery from the console AND the Memory Unit (both use the same model of battery) I've just bought for a massive CR2477 battery, wich, according to my calculations, should last another 25 years or so without issues. I'll be using battery holders for both, so I won't need to mess with solder the next time the battery fails. The memory unit also has one single cap inside, wich will also be replaced for a much better long-life cap. Last but not least, I'll be replacing the cooling fan in my Fz-1 for a brand new one, with higher airflow, and lower noise than the original fan. Looking forward to seeing how this turns out. Good luck! YouTube archive of my first (and so far only) 3DO stream on Twitch. Some of the caps arrived today and I've replaced them. PS: I found out that the metal shield and basically the whole system was made with the original capacitor size in mind, even something as little as 2mm more in the height or diameter, will have problems to fit inside the system. Same thing goes to the CD drive, there are caps right below the CD laser, if you install anything over 5-6mm tall there, they will stop the laser from moving and possibly cause serious damage to the whole thing. Had less height than the original cap, but was wider, because of this, I had to move the 6.3V 1000uF to the side, and bend the metal shield where it touches the CD drive. I manged to fit everything in place, though it's not exactly good looking hahah. Also replaced the 3 16V 100uF caps on the CD drive board, I choose Sanyo SP Oscon solid caps for this. The problem I had with these was not in their size, but in their legs. The gap between the legs of the original capacitors was around 2mm, while the Sanyos came with a 5mm gap. Also replaced the 6.3V 22uF on the CD board, also for solid Sanyo Oscon solid. This one was easy, first because my cap had long legs, and second because you can replace it (and a few others) without disassembling the whole CD drive. So far, the console still works fine, but the audio slowdown persists in GEX. I'm sure this is a no brainer to you, but for any caps you can't quite fit, you could always extend them out with a little bit of wire and stick 'em wherever you can fit them. In all my console modding and portablizing, I couldn't tell you how many components I've had to relocate over the years. Never pretty, but it works. Can always add a dab of hot glue to keep them from moving, wherever you've relocated them to. Here's a pic of my original Xbox using a 50F super capacitor for the clock. I don't -like- to do it, but I will if it's needed. I must admit I'm having fun changing capacitors in my systems, it feels like tuning a car, or doing something to improve your home. Yesterday I worked on my SegaCD model 2, It worked fine but would stop reading discs after a while. I changed some capacitors in the CD drive (most of them are the SAME found on the 3DO's CD drive hahah), and that problem stopped. But I also wanted to recap that whole system as well, and one of the capacitors I needed for it also arrived. Premium Elna audio capacitors, the same kind I'll use in the audio circuitry of the 3DO. After changing all the 17 capacitors of the audio portion of the SegaCD, I powered it up, and tested it with my Daft Punk RAM CD. Just changed the 6.3V 1000uF capacitor of the power supply area, from my researchs, this is the capacitor with highest failure rate on the system, and the big 25V 6800uF comes in second. Choose a Fujitsu solid capacitor for this, the same kind you'd find in high-end motherboards. But, for some reason, I get the feeling that the console seems more stable now, and also seems to be booting the games faster than before. Maybe because these consoles all came from Japan originally, and were released around the same time, they share many similarities electronic-wise. Changed the fan today. Bought a 12V sunon Maglev 40mm, changed it's connector for the one that came with the original fan. Although the console feeds the fan with 9V, there's not much problem in using a 12V model instead, it will just spin slower. Also, this Sunon fan has much higher airflow than normal 40mm fans on the market, without being noisy. So, even spinning slower, it's actually pulling more air out than the original fan. Acrof wrote: Changed the fan today. 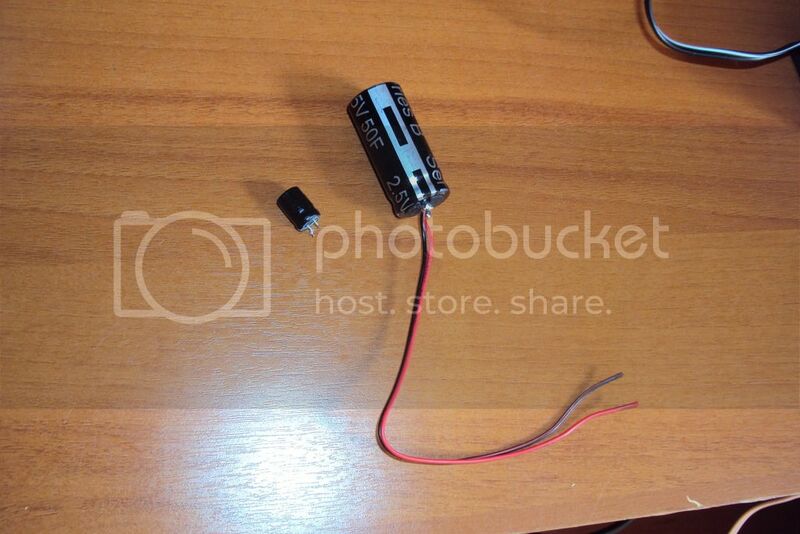 Bought a 12V sunon Maglev 40mm, changed it's connector for the one that came with the original fan. Nice work. Still really weird about Gex though. I wonder if maybe Gex does something that other games don't. You could try to track down one of the original programmers. I know that sounds like a weird suggestion, but I've actually had great luck in the past doing that with various games. Most of the time they're just happy to hear some one is still enjoying something they made years ago. Also getting the recognition. A lot of times, we don't hear about the programmers and stuff of games. Unless they do something revolutionary, like John Carmack for instance. The slowdowns happens when music and a sound effect are played at the same time. Something could be out of sync, I've also thought about the crystal oscillators of the console (I found 3 in the main motherboard, an 1 more on the CD-drive board), if they're bad the console could have serious issues. For gex I can just buy another 3DO. Thought about buying a FZ-10 with a dead laser. That wouldn't be a problem as I do have a spare laser here (bought for my Fz-1 to try to solve the Gex problem, and both the Fz-1 and Fz-10 use the exact same laser). CR2477 arrives, and I've istalled them in the console and memory unit, with proper battery holders. Of course I choose a Panasonic batteries, to match the brand of my console. Also changed the 6.3V 100uF caps in the console, and one more in the CD-rom drive. Replaced the original caps for solid Sanyo Os-con caps. I don't have other consoles capable of CD playback, except for my PS2, PS3 and Xbox(first model), wich can output better sound because all of them are connected to my receiver via optical Toslink cable. The digital connection on these modern consoles can't really be matched by the analog circuitry found in these old CD consoles. Most of the capacitors in the system were replaced already, problem with Gex persists, but something funny happened this time, instead of a instant slow down as soon as the "GEX" logo is sprayed in the screen (music + sound effect), this time it took half a second for the slow down to occur. On the main board, only a 16V 10uF, a 16V 22uF, and the 4 SMD 6V 100uF remains to be replaced. When those are gone, the whole motherboard will be using fresh, high quality capacitors, wich should last even longer than the original caps. 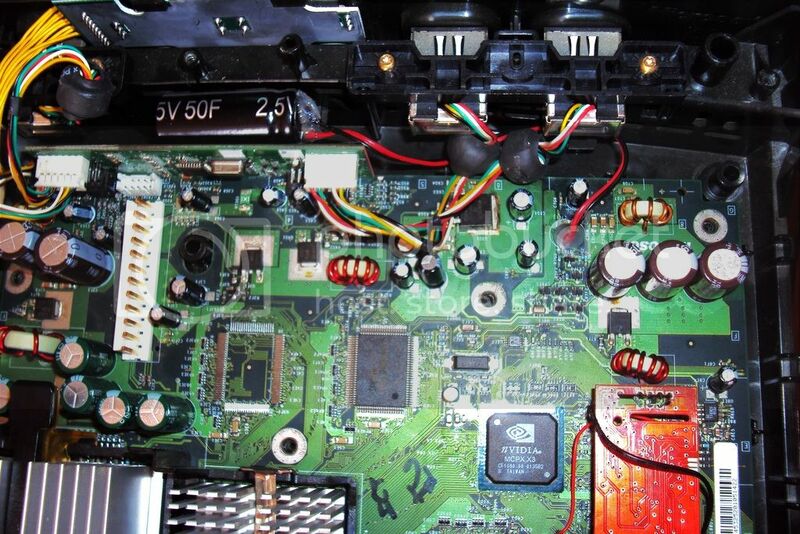 There's a few caps to be replaced on the CD-Rom drive board too: 50V 1uF, and 6.3V 22uF. Bad news is that I decided to open the joystick today. I remeber I saw a picture of it's board in the past, and that it had a capacitor inside. And I have 2 controllers, both are the oldest model with a headphone jack. But one is the Panasonic controller that came with my Fz-1 system, the other is a Sanyo controller (I bought cheap for multiplayer games), but they share the same guts, wich means I'll have to buy 14 capacitors more. Oh joy. That's why the sound coming from the controllers is a lot worse than what comes from the main output of the console, it's a cheaper and much more compact circuit. I'll recap my Panasonic controller first with the best audio caps I can fit in that tiny space, then I'll compare the sound quality between the Sanyo and the recaped Panasonic controller to see if there's a noticeable difference. Stay tuned! Ive never recapped any Panasonic product ever, 4x 3DOs included, and only one died. From salt air corrosion. I doubt replacing all those capacitors is worth the effort, some may fail, but not all of them will. Mine are all still prefect and clear. Get an ESR tester and leave the good parts where they belong. Also, my 3DO's sound already had weird crackling noises due to capacitor aging. Not only that problem is fixed now, but the console probably sounds better now than it did back in the day it was released. A little update on the matter: Every single cap was replaced, except for the 4X SMD 6V 100uF on the RAM memory area. Slowdown in GEX is still present, everything else works wonderfully. Same with the Sunon fan, and same with the gigantic CR2477 back-up batteries in both console and memory unit! My main guess now is that there's a bad crystal oscillator somewhere. The console has 3, the cd drive has another one, 4 crystal oscillators in total. I'm still waiting for the SMD capacitors on the memory area, so I can't assume for sure it isn't a capacitor issue. I hope they deliver it soon. Really hope you're able to ferret out the problem. As far as the oscillators, this post lists them with part number. The post above that in the same thread had a link to something from Panasonic that no longer works, unfortunately. Edit: Found this. But it seems they are out of stock. Edit2: They seem to have them for special order here. Edit3: Can't seem to find the actual values of the oscillators due to them being Panasonic proprietary parts. However, we might have more luck with Goldstar or Sanyo. The whole idea of the 3DO standard was...well, a standard. Needs more googling. Well, finally changed the last remaining caps. The 4 SMDs 6V 100uF caps were replaced by Sanyo SVP of the same value. There's solid caps everywhere you look, the big brown one on the power supply, and the black and gold Elnas for audio. Issue with GEX persists, everything else is still perfect. Can't seem to find the actual values of the oscillators due to them being Panasonic proprietary parts. However, we might have more luck with Goldstar or Sanyo. The whole idea of the 3DO standard was...well, a standard. Needs more googling. I did get my hands on a repair manual, but for the Fz-10. The whole design is different, much less components, if I remeber right it had only one crystal oscillator in the whole system! I remember seeing a picture of the Sanyo motherboard, it looked somewhat similar to the Fz-1, component wise. That way I could try different combinations of CD drive and motherboard, and find wich one is faulty. I wouldn't mind moving all the new capacitors to a new board, if I found one that worked. This crystal oscillator (DECL50000P2W), in the sanyo, is a Kyocera 500000 Hz oscillator. So it's safe to assume it's frequency: 50MHz, like the one in the Sanyo! Hey nice thread Acrof, my fz-1 has just died, like two days ago. Farout i've had a good run out of it. When i boot her up i get the 3do logo then some flicker, a bit of green light then no green light and constant red light. I got the disc out of it eventually but now the tray don't open at all. Man i was so depressed...but now i have found this topic i have hope again. Weird symptoms. When the 3DO logo comes up, is it in the normal colors? But yeah I'd bet a recap would likely fix it. Good first thing to try, anyway. Yeah, the 3DO logo flashes on and off in it's normal colours for maybe 3-5 seconds then black screen. Red power led stays constant with one little flicker of the green led when i turn it on. I mean, i got nothing to lose really, i can solder a bit so i'll have a crack a recap mission. Worst case scenario it could end up as spare parts. Is that with a disc in or with no disc? If you don't have a disc in, does it go to the normal "space potato" thing? I'm guessing not. But if it does, could just be your laser's given up the ghost. Along with the drive mechanism, it sounds like. Once you get it apart, could be the belt came off. Well, assuming the 3DO's disc drive uses one. I haven't yet had the need to disassemble it.